Easy to enjoy crafting: So, look at this not perfect blanket, but so cute…the picture, also not perfect, and look at the crap hiding next to the blanket. Oh and the background is so yucky…hahahaha. Who cares. Look. 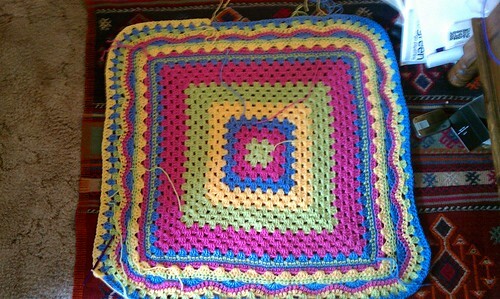 My happy “what gender will it be” blanket is almost done. Yeah, things I like. Thanks for your input critical mind, but I’m still happy about it. We have worried about Fabulous Husband’s mom not having a grandkid Hooray! Welcome new grandbaby! Easy to move: So an unnamed couple had purchased a loan with the mother-in-law carrying the mortgage because their credit rating wasn’t so good. The mother-in-law collected the mortgage insurance tax break, although the couple was paying it, for the six years they lived there. Seems a little counter productive, since the *sigh* “middle class” can’t really afford to buy a house without the mortgage interest tax break. So after six years, the hard-working couple had struggled financially long enough and were fed up. They moved out, a decision that for years had wracked them with guilt, worry, and panic. They were going to let the bank foreclose on the loan. Relationship with mother-in-law be damned. So they worried that mother-in-law would freak and disown them. SURPRISE! For now, mother-in-law has not disowned them, wasn’t angry and even expressed some compassion and understanding. Oh, so surprising when things are easier than we think they’ll be. They love their new house and will now have pocket money for fun adventures for their family!–Update: turns out that the daughter had to threaten to disown the mother and then the mother sent a mean email, but then tried to make up for it–so I guess it wasn’t really that easy, but still…as fabulous husband says, you gotta do what you need to do. In other words, don’t be codependent (another word, like consciousness, that is used in ways that make me cringe, but there it is). Easy to tell stories of ease on the outside/Plans confuse the gremlins: So after talking about other people’s ease and crafting, I have to say to myself, and also to you, dear reader, what’s going on inside? Well, I’m okay. No panic, no crying. A little bit of “eh” about going back to work tomorrow now that Spring break is over. Going to enjoy cloudy day, laundry, lunch with a friend, and grocery shopping. Maybe go to tiki bar where Fabulous Husband will be playing records. So lots of plans. Plans help. Also making plans for August vacation to Florida to see FH’s (Fabulous Husband’s) mom. Got the tix free with my Southwest Frequent Flyer miles. Hooray. Also making plans to visit family in Santa Fe in June. So plans. The internal forces (gremlins) that don’t like me are a little flabbergasted and confused by plans. Hehe. Points for ease!!! ps: don’t know why the wiki words are highlighted. please ignore that little sign of imperfection, or celebrate it, whatever. This entry was posted in Uncategorized and tagged crafting, crochet, Family by Project Easier. Bookmark the permalink.